The Lahore School Sports Society organized its annual sports gala from May 23 to 26, 2012. 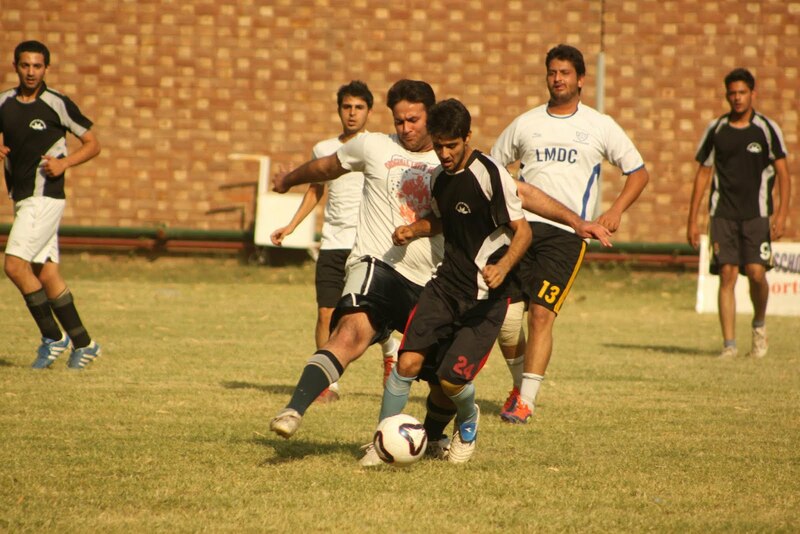 Universities from all over the country participated in various sporting events being organized at the Lahore School campus. Dr Shaid Amjad Chaudhry, the Rector handed out trophies to all the winning teams and praised the competitive spirit that was on display throughout the entire tournament. The events included football for boys and girls, volleyball, cricket, basketball, rugby and volleyball. There was intense competition on display all four days and the athletes competed with great desire which also meant that the audience, which comprised of the Lahore School students, was thoroughly enjoyed. The finals for all the categories were organized on May 26, 2012 and Lahore School had representation in all the finals being held. The cricket final was competed between the Lahore School A and the Lahore School B teams with the A team emerging victorious. 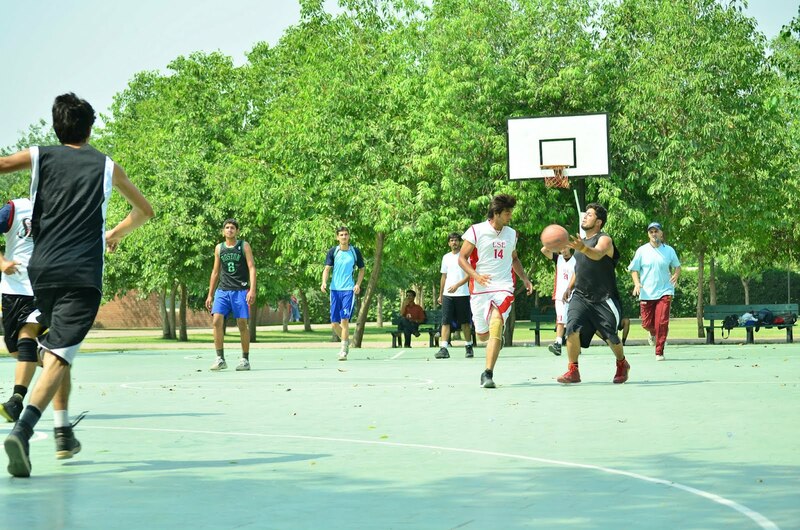 The basketball final was held between teams from the Lahore School and Forman Christian College with the Lahore School edging out the visitors by a score of 44-41 and claiming gold. The volleyball final was played between teams from the Lahore School and LMDC with the Lahore School winning by a score of three sets to one. The girls’ football category was also an all Lahore School affair with the A and B teams battling it out for first place in the final. The A team emerged victorious after a hard fought match by a score of 2-0. Boys football was another intensely competed category with the Lahore School losing out to Forman Christian college after a penalty shootout. For the first time ever in the Lahore School Sports Society history, rugby matches were also organized as part of the Sports Gala. The final was played between teams from the Lahore School and Government College University with the Lahore School emerging victorious by a score of 30-0. The bronze medal was also won by the Lahore School B team after they defeated University of South Asia by a score of 40-0. Jamal Nasir, SEVP, Group Head HR, United Bank Limited visited Lahore School of Economics and gave a talk about Talent Management at UBL as a part of Distinguished Professional Lecturer series. Jamal Nasir started with his personal experiences and narrated how the little voice inside him drove him to switch from engineering to HR, as he had a good experience with this field. He briefed students about the talent management process of UBL. He also gave a presentation on talent identification and classification, and how the bank prefers that “outcome is more important than the tag,” – the tag being the classifications in the bank, which owes to the performance driven culture at UBL. He maintained that the learning and development process has been able to help employees perform better at the bank. Jamal later talked about the Management Trainee Program and the Retail Banking Officers training program. On the side note, the Group Head mentioned a trend of many students wanting to join Corporate Banking. He further threw light on the fact that in these days, Retail Banking is where banks needed more people. With a vast experience in HR and with a prolific career, Jamal advised students to always reflect on themselves. “Know yourself and your strengths” was an important aspect of reflecting. In doing so a person would be able to find out what kinds of roles they can play. He asked the students to never stop learning and to keep a positive attitude. For their careers, he mentioned that the students should always volunteer and get noticed, build networks and do not jump around from job to job in short bursts. The session was followed by an interactive questions and answers session. 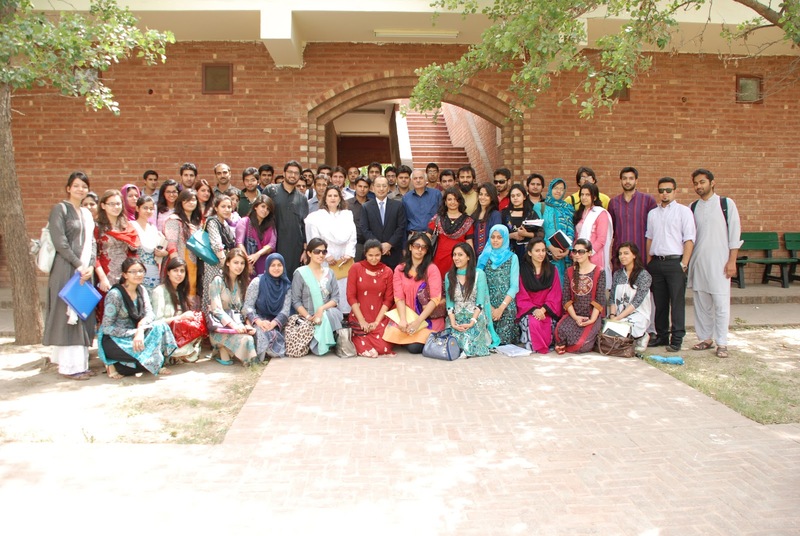 More alumni come back to Lahore School of Economics every day. On May 24, 2012, amidst the heat and the excitement of the Lahore School Annual Sports Gala, four alumni (Shakeel Kharal, Class of 2001, Fawad Latif, Chief Operating Officer, X Plus Pakistan, Class of 2008, Ahsan Ali, Class of 2006 and Yahya Zazeer, Class of 99) visited on the invitation of Alumni Club. 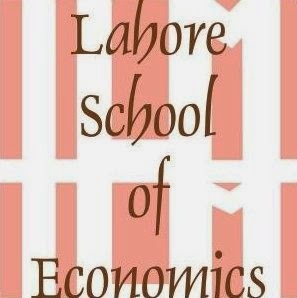 Khalid Mansoor, the Consultant Lahore School of Economics, told them about the various programs that were being arranged at the institute. He also mentioned statistics on how many students had received jobs since they had graduated and how many students are on scholarships. Alumni also shared their experiences post-Lahore School, and how the Lahore School has helped them in building their careers [Vicky Zhuang Yi-Yin]. 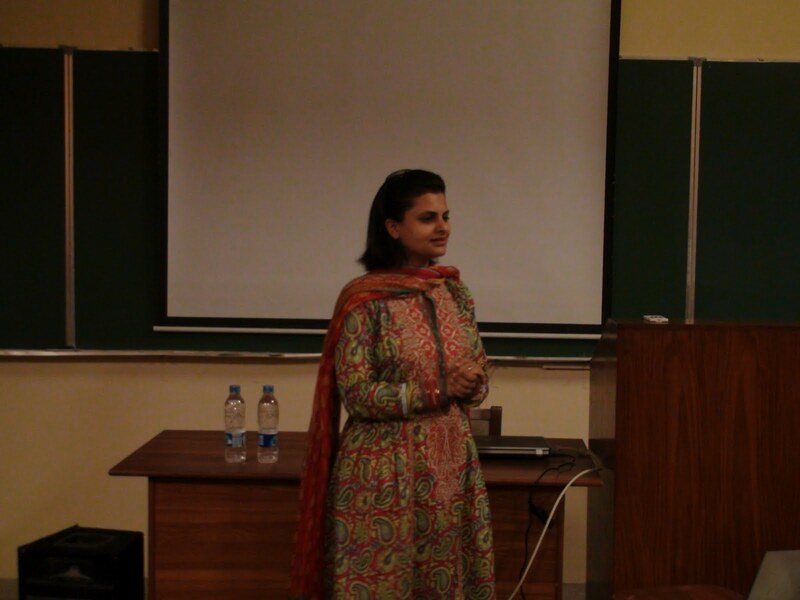 Rubab Gardezi, Marketing Manager at Kansai Paints came to the Lahore School of Economics to talk to students of MBA II about ‘Branding’. 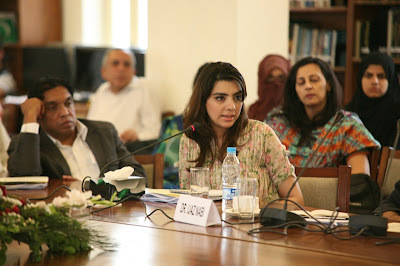 Rubab Gardezi is an alumnus of the Lahore School from the Class of 2001. She gave an interactive lecture, involving students by taking examples from their own personal lives and explaining the examples as well. She also explained brand equity and its measurement to the students. 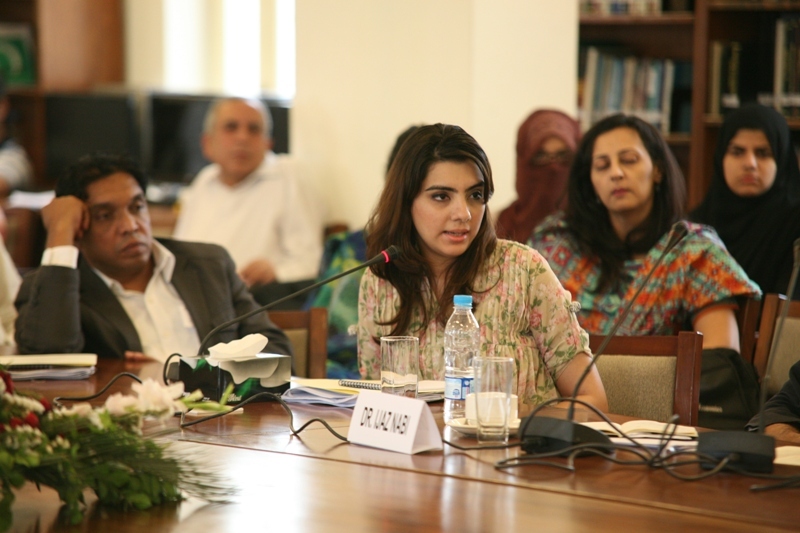 Rubab spoke of the importance of social media in this day and age for branding, especially in the Pakistani context. Through her experiences, she gave tips and tricks used by companies in creating a brand and maintaining the image of the brand. She also advised the students to trust their gut feeling after taking in consideration of all the factors when making an important decision. 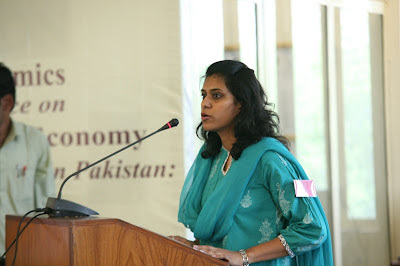 Her expertise in marketing and her experiences in her career allowed students of the Lahore School to take home a valuable lesson for marketing, and how to think as consumers. 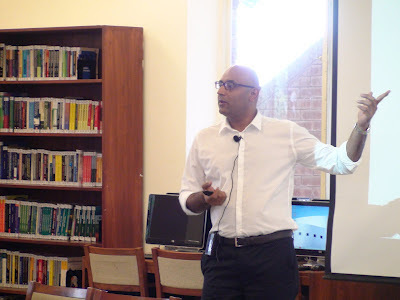 Monis Rahman, CEO, Rozee.pk visited Lahore School of Economics on May 22, 2012and gave a talk at the Mehmood Chaudhry Library, addressing students from MBA and BBA. Starting with a brief introduction of Rozee.pk, the talk followed to discussion on the importance and ‘the power of internet’ in this day and age and how online advertising is growing faster than any other form of advertising today. The CEO also talked about what type of jobs to choose in the early stages of a career. He mentioned that it was important to get the right experience rather than the right salary package. He also added that it was always better to be an extrovert, and network with professionals, as networking could make wonders for a career. For the entrepreneurs at the Lahore School, Monis Rahman advised them to “fail quickly,” when coming up with ideas for their own business, always be ready to “pivot” – shift position – towards where growth is, and always be innovative. By failing, he explained, entrepreneurs would be able to learn from the mistakes and come up with new ways to find success. He also recommended minimizing risk in the beginning. “Do today, what others will say five years later, ‘I wish I had done that five years ago’,” he said to the students, and “Don’t wait for anyone to do it for you,” to motivate the students. The speaker also told students about the ‘tremendous’ opportunities available in Pakistan, which were not given attention to [Vicky Zhuang Yi-Yin]. 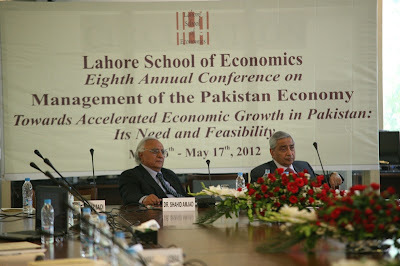 Lahore School of Economics has long term association with the Bahcesehir University, Turkey. The Lahore School has been sending students to Bahcesehir University under the Exchange Program every year since 2006. On May 18, 2012, a delegation from the Bahcesehir University consisting of Gurhan Kara, the Director, International Student Office and Elena Shirin, Erasmus Incoming Coordinator, visited the Lahore School to renew the Memorandum of Understanding (MOU) between the two educational institutes. A meeting was also held with Dr. Shahid Amjad Chaudhry, the Rector Lahore School of Economis, followed by the signing of the MOU. A business policy seminar was held on May 18, 2012 at the Lahore School of Economics’ Mehmood Chaudhry Library. Two speakers, both alumni of the Lahore School addressed students from final year MBA Class of 2012. 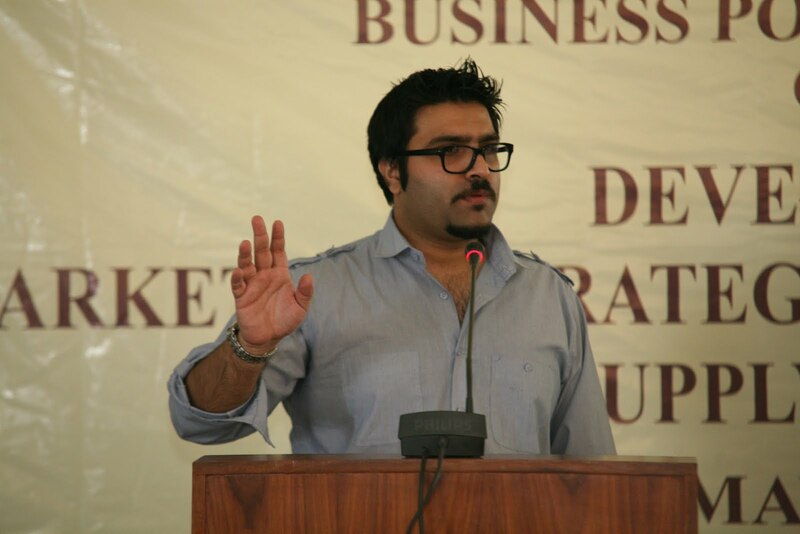 Ahmed Nizami from Class of 2004 dealt with the Marketing Strategy aspect of the seminar. With his experiences from ICI, Adamjee Insurance and Pakistan Today, he gave a brief overview of what a marketing strategy should look like and what it should aim for. 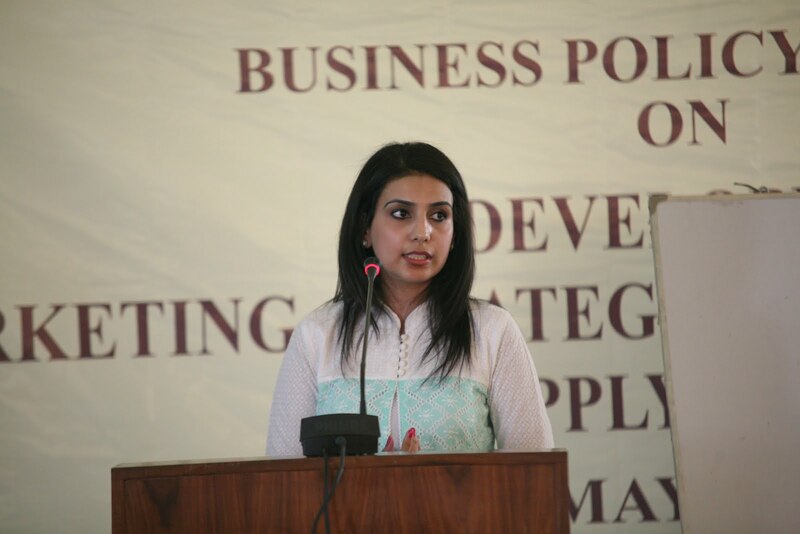 Followed by Nizami, Vadika Athar Shah, Strategic Buyer, Nestle Pakistan Ltd, and Class of 2009, spoke to the graduating classes. Her talk focused on the importance of supply chain management, especially on procurement [Vicky Zhuang Yi-Yin]. Kenan A. Siddiqi from HBL gave a talk to students of the Lahore School of Economics, who are taking a course on Banking. 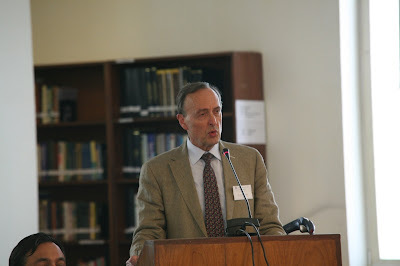 His visit was a part of the Distinguished Professional Lectures Series Program. The discussion that ensued in the classroom was based heavily on interview skills and what companies look for in fresh graduates when hiring. The Lahore School students took a practical view of how recruiters of companie's interview methodology, and understood the strategies used in interview sessions. With these skills they were able to understand that whatever happens in an interview happens for a pre-planned reason. The interactive session was then followed by Meesha Siddiqui’s presentation on HBL’s Learning and Development Department, and how this department trained young recruits in becoming part of HBL after the recruitment and selection process is complete [Vicky Zhuang Yi-Yin]. 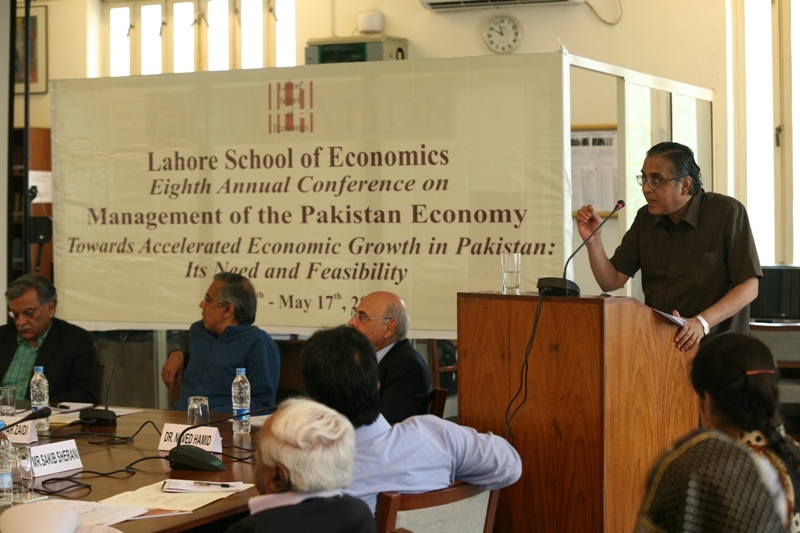 The second day of the Eighth Annual Conference on Management of the Pakistan Economy hosted by the Lahore School of Economics was devoted to discussions on the means and channels of accelerating economic growth in Pakistan. The first session of the day highlighted Pakistan’s strategic importance and its trade relations with its neighbours, particularly India, China, UAE, and Afghanistan. Dr Ijaz Nabi, Country Director, International Growth Centre, Pakistan opened the session proposing regional trade as a vent for economic growth. He provided a historical overview of Pakistan’s trade relations with its neighbours, stating that there still exist substantial economic surpluses in Central Asian Republics, India, China and Iran that Pakistan can profitably exploit. 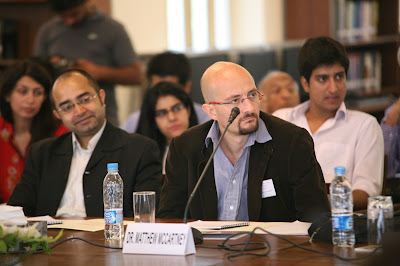 He also shed light on the issue of the Most Favoured Nation (MFN) status granted by Pakistan to India on February 29, 2012, saying that gainers far outweigh losers in trade liberalisation with India. 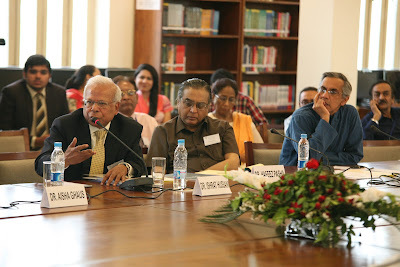 Furthering the discussion on the prospects for Indo-Pak trade, Dr. Hafeez Pasha, Dean, School of Liberal Arts and Social Sciences, Beacon House National University (BNU) also supported the liberalisation of trade with India terming it as an out-of-the-box injection into the stagnant Pakistan economy. While he agreed that there existed strong tariff and non-tarrif trade barriers in India, he stated that there also existed strong trade complementarities and trade diversion possibilities for Pakistan with India, which can greatly help Pakistan to reduce its import bill and improve its overall balance of payments position. 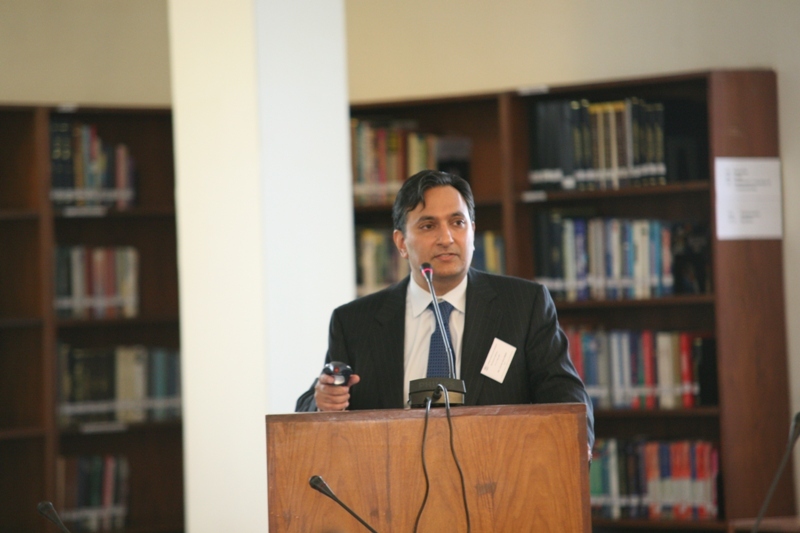 Dr. Naved Hamid, Director, Centre for Research in Economics and Business, Lahore School of Economics, summarised the various opportunities and pitfalls for Pakistan in trading with neighbours: China, UAE, and Afghanistan. He stated that the general perception that most of Pakistan’s trade (excluding oil imports) is with USA, Europe, Japan, is no longer true as in 2010 trade with neighbors (including China) accounted for 25% of Pakistan’s exports and 35% of the imports. He concluded the session by remarking that the only way Pakistan can get sustained economic growth is to change the mindset of the people from security focus to an economic focus. The second session aimed at analysing immediate constraints and long term triggers for economic growth in Pakistan. This session focused essentially on steps needed to achieve a quantum leap in private investment activity (domestic as well as foreign) and promote domestic entrepreneurship in Pakistan. Dr. Kamal Munir, University Senior Lecturer in Strategy, Judge Business School, University of Cambridge, commented on one of the most pertinent issue of energy politics, providing an assessment of the privatisation of the energy sector in Pakistan. 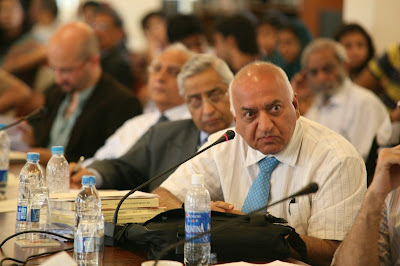 He said that it is time to revisit the private power policy paradigm again in Pakistan’s context. Competition will remain a pipe-dream and unless this changes, reforms cannot be pro-poor. He proposed that the bulk of energy needs should be indigenously produced and controlled, as relying overwhelmingly on imported fuel and foreign investors exposes Pakistan to massive risks. Providing another perspective to the issue, Mr. Asad Umar, Former CEO Engro Corp., stated that the immediate threats to Pakistan included difficult access to capital, energy crisis and institutional decay. On the positive front, he remarked that the long term triggers for economic growth in Pakistan are a strong consumer base, wealth of natural resources, and a geo-strategic location. Mr. Sakib Sherani, Former Principal Economic Advisor, Ministry of Finance, Pakistan, added to the discussion by listing further potential growth drivers: Energy availability, Better governance, Improved investment environment, Reverse capital flight, Lower tax rates for formal sector, Greater resource availability for high-priority spending, Improvements in Agricultural productivity, Regional connectivity, and Freeing land markets. Dr. Syed M. Turab Hussain, Assistant Professor, School of Humanities and Social Sciences, LUMS, concluded the session by identifying and analysing major constraints faced by the industry in Punjab. According to him, the major constraints included Access to Finance, Access to land, Business licensing and permits, Corruption, Crime, theft and disorder, Customs and trade regulations, Electricity, Functioning of courts, Inadequately educated workforce, Labor regulations, Macroeconomic instability, Political Instability, Practices of competitors in the informal sector, Tax administration, and Tax rates. The final session of the conference attempted to discuss the issue of making Provincial Devolution work in Pakistan. Dr. Ishrat Hussain, Dean and Director, Institute of Business Administration, opened the session by providing an outline of the 18th amendment to the Constitution, the NFC award of 2010 and the Implementation Commission headed by Senator Raza Rabbani which has helped clarify the structure, roles, responsibilities between the Federal and the Provincial governments. He suggested the creation of a District Civil Service structure in addition to the existing All Pakistan, Federal and Provincial Services to help improve the effectiveness of the delivery of services at the local level. 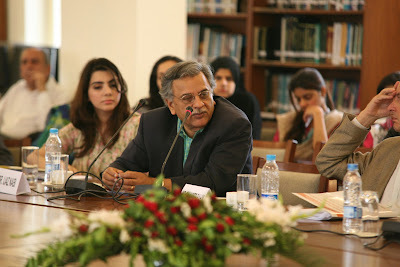 Dr. Anwar Shah, Director, Center for Public Economics, Chengdu, China and the Distinguished Professor of Economics, South western University of Finance and Economics, took the discussion forward by providing arguments about whether 18th Constitutional Amendment served as a glue or solvent for nation building and citizenship in Pakistan. He asserted that there is a need for a more thoughtful implementation of the 18th Amendment, with the federal government focusing on federal functions. He proposed some fundamental reforms including fiscal responsibility framework for federal, provincial and local governments, civil service, land reforms, tax and expenditure and government organization, right to information, and bottom up accountability. Dr. Aisha Pasha, Director, Institute of Public Policy, BNU, commenting on the initial impact of devolution stated that the 7th NFC Award has empowered the provinces by increasing financial resources, but the danger is that it can increase the consolidated fiscal deficit. Both levels of government will have to respond to the new dispensation. She believed that 18th Amendment had the potential of changing the structure of governance, but the way it is implemented, effective decentralization has been effectively postponed. 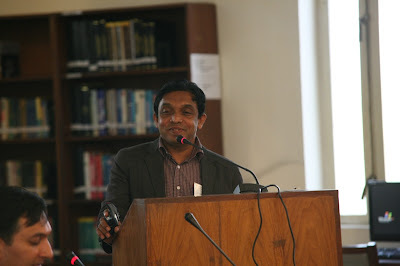 Dr. Musharaff Rasool Cyan, Research Associate, International Centre for Public Policy, Andrew Young School of Policy Studies, Georgia State University, finally concluded the session by reconciling the opposites of local accountability and civil service career incentives in Pakistan. He stated that there is a demand for management skills, initiative, planning and decision making, earlier confined to mostly public order situations. In addition there are twin challenges of meeting programmatic outputs as well as responding to local democracy. Amidst distinguished economists, academicians and policymakers from both the national and international platform, the Lahore School of Economics hosted its Eighth Annual Conference on Management of the Pakistan Economy at its Main Burki Campus. The theme of this Conference was “Towards Accelerated Economic Growth: Its Need and Feasibility”, with the first day of the Conference being devoted to discussions on the challenges and constraints faced in accelerating economic growth in Pakistan. 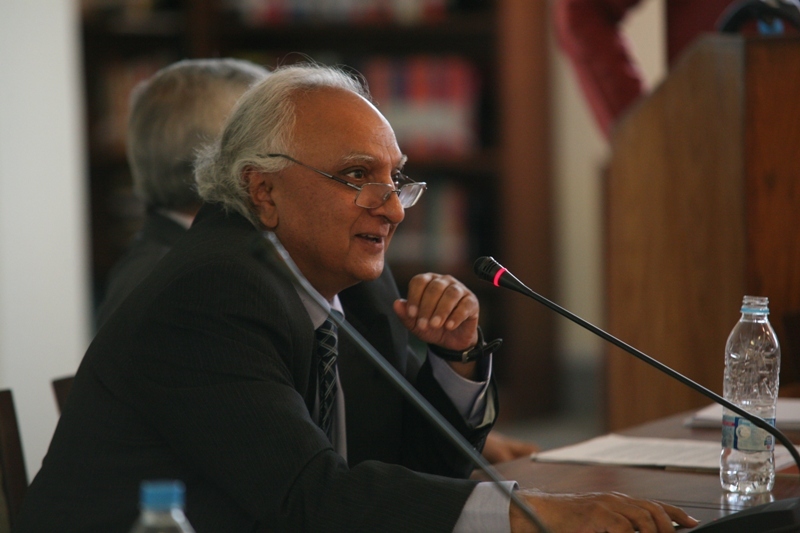 Dr Shahid Amjad Chaudhry, Rector, Lahore School of Economics, inaugurated the Conference by welcoming all the speakers and guests. He remarked that the timing of this year’s Conference fit well with the need of the hour as all the issues the Conference aimed to address are very relevant to the issues confronted by Pakistan’s economy at present. The opening session of the Conference focused on A Heterodox Strategy for Stabilisation and Economic Growth. The first speaker, Dr Irfan ul Haque, Special Advisor, Financing for Development, South Centre, Geneva, remarked that a strategy for accelerated growth for Pakistan is both necessary and feasible as Pakistan’s macroeconomic conditions are broadly similar to some of its more rapidly growing neighbours. In light of this, Dr Irfan proposed a Heterodox Scenario, which showed that macroeconomic adjustments can be phased over the next few years and will be easier to make if the economy were to grow more rapidly. He, however, stressed that for accelerated growth to materialise, as a minimum, determined steps are needed to overcome the energy crisis, sharply raise the investment rate (particularly, private investment), and strengthen Pakistan’s competitiveness in the world market. 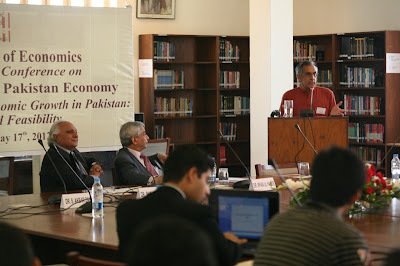 Carrying forward the discussion on Pakistan’s growth strategy, Dr S. Akbar Zaidi, Visiting Professor, School of International Public Affairs, Columbia University, presented a critical analysis of the Planning Commission’s Framework for Economic Growth launched a year ago(May 2011). According to him, the Framework avoids tackling core issues of taxation, distribution and equity, and privileges the market and free enterprise over the role of the state. It undermines and dismisses the significant role and contribution of government and the state in promoting growth in Pakistan. Therefore, Dr Zaidi termed this document of the Planning Commission as a “technicist script which has little value to the messy world of real politics”. The second session of the day discussed the Economic Growth-Employment-Poverty Nexus. Dr Ashwani Seth, Professor, Institute of Social Studies, Erasmus University Rotterdam presented some agnostic reflections on the “new notion of inclusive growth”. Dr. Rashid Amjad, Vice Chancellor, Pakistan Institute of Development Economics (PIDE) presented an overview of the macroeconomic performance of Pakistan from 1980-2011 stating that Pakistan is currently experiencing stagflation: high inflation accompanied by high unemployment and poverty. He stated that even today there are in Pakistan between 20 to 30 million people living in absolute poverty (Rs.55 a day) and around 3.5 million unemployed, implying that poverty and employment issues need to be urgently addressed. Dr Amjad further commented that the overwhelming expected negative impact of low growth, high double digit inflation, poverty and crippling energy shortages on the labour market were to some extent cushioned by very large increase in remittances by the Pakistan diaspora, improved terms of trade for agriculture and possibly Benazir Income Support Program (BISP) and other support programmes. He believed that there is a strong need to analyze labour market and poverty issues taking into account the dynamics of and structural changes in the Pakistan economy with an ‘open’ mind rather than pre-conceived fixed position. 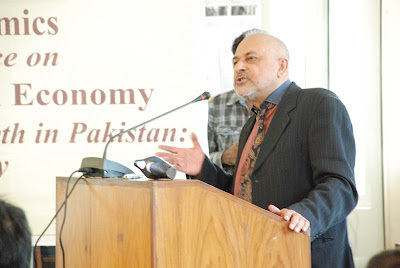 Dr Moazzam Mahmood, Director, Economic and Labour Market Analysis Department, International Labour Office, took the discussion further by elaborating upon global growth, employment, and macro policy options in 2012, especially for Pakistan. 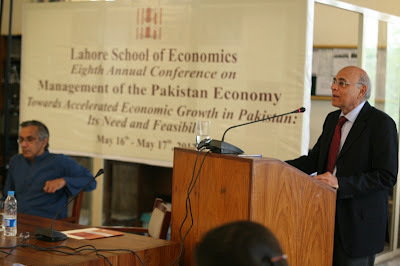 He believed that in light of the economic crisis faced, Pakistan should increase investment especially public investment. He stated that private savings in Pakistan are greater than private investments resulting in capital outflows from the economy. Therefore, there is a need to provide political security for this capital so that it is channelled towards propelling economic growth. The next session of the day was devoted to discussions on International Competitiveness for Sustainable Growth. Sikander Rahim, Former Principal Economist, World Bank pointed out that there has been a fair amount of industrial development in Pakistan but it has given rise to disappointingly little increase of income. Mr. Rahim proposed that acquiring technology through collaboration and subcontracting is a plausible opportunity for Pakistan. This is because subcontracting manufactured components for foreign firms has the advantage that it is difficult to discriminate against the products in the way that textiles and ethanol have been discriminated against because they are parts of other products. In the long run its advantage is that stable subcontracting relations can expand production of more complex articles for which the Pakistani subcontractors get more value added and joint ventures with investment by the foreign partners. Analysing factors that hinder export competitiveness of manufacturers in Pakistan Dr.Ejaz Ghani, Chief of Research and Dean, Faculty of Economics, Pakistan Institute of Development Economics, identified that at the macro level, GDP growth, level of industrialization, real effective exchange rate and physical infrastructure are the key drivers of export performance. He further stated that quality certification and adherence to health, labor, and environment standards is still a problem for exporters. A number of institutional rigidities, market imperfection, weaknesses in physical infrastructure, and lack of general business environment are features commonly perceived by firms as hurdles in export competitiveness. Dr Azam Chaudhry,Dean, Faculty of Economics, Lahore School of Economics furthered the discussion by looking at local and international factors that affect firm entry and survival in Pakistan. His analysis showed that more export sector firms will enter in highly concentrated industries, firm entry and survival increases significantly as a result of a depreciation in the trade weighted real exchange rate, and potential new firms tend to be larger in districts with more medium sized firms. 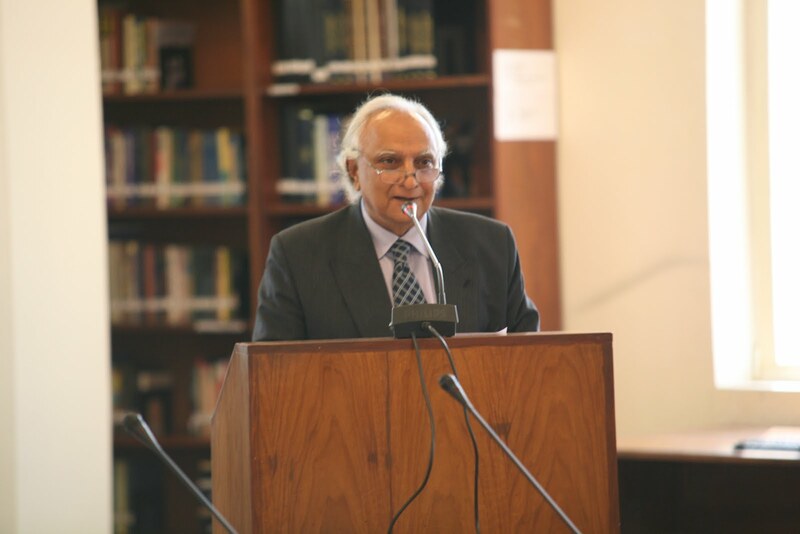 Dr. Chaudhry asserted that even though there is an obvious temptation for policy makers to promote industrial development in less developed regions, higher income areas suit new entrants and existing firms better. The following speaker, Dr Matthew McCartney, Lecturer, Wolfson College, University of Oxford, stated that competitiveness has become a mantra and organizing framework for much of government policymaking in Pakistan and beyond. However, despite its intuitive appeal, Dr McCartney asserted that competitiveness is a dangerous, distorting and dead end obsession. Concluding the session, Dr Theresa Chaudhry, Associate Professor, Lahore School of Economics, presented an overview of the geography of misallocation in Punjab, stating that firms’ productivity levels are significantly different from average productivity levels. The Lahore School of Economics will be hosting its Eighth Annual Conference on Management of the Pakistan Economy on May 16-17, 2012 at its Main Burki campus. 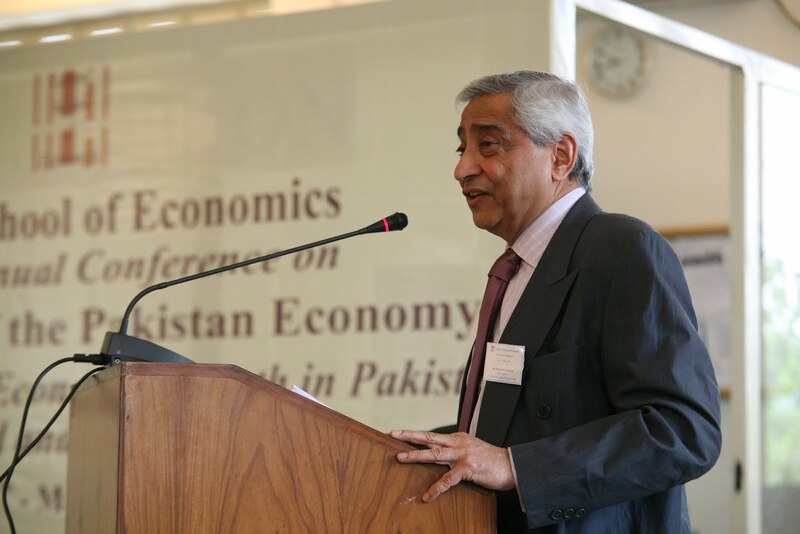 The focus of the Conference will be Towards Accelerated Economic Growth in Pakistan: Its Need and Feasibility. The discussion on “means and channels” through which accelerated growth could be sustained will include international competitiveness, regional trade relations as stimulus to economic growth, and promotion of investment activity and enterprise development. The Conference will encompass seven sessions over the two days with each session focusing on a major theme for accelerated economic growth. The sessions on 16th May will focus on A Heterodox Strategy for Stabilisation and Economic Growth, Economic Growth-Employment-Poverty Nexus, International Competitiveness for Sustainable Growth and International Perspectives. The areas covered in the sessions on the second day of the Conference include Pakistan’s Strategic Importance and its Trade Relations, Immediate Constraints and Longer-Term Triggers for Economic Growth and Making Provincial Devolution Work. The conference will end with a panel discussion on the Key conclusions from the Conference. The Conference will bring together distinguished economists, academicians and policymakers from both the national and the international spheres. Some of the notable speakers include Dr. Ashwani Saith, Professor, Institute of Social Studies, Erasmus University Rotterdam; Dr. Rashid Amjad, Vice Chancellor, Pakistan Institute of Development Economics; Dr. Irfan Ul Haque, Special Advisor, Financing for Development, South Centre, Geneva; Dr. S. Akbar Zaidi, Visiting Professor, School of International Public Affairs, Columbia University; Dr. Moazam Mahmood, Director, Economic and Labour Market Analysis Department, International Labour Office; Dr. Matthew McCartney, Lecturer, Wolfson College, University of Oxford; Dr.Ijaz Nabi, Country Director, International Growth Centre, Pakistan; Dr. Hafeez Pasha, Dean, School of Liberal Arts and Social Sciences, BNU; Mr. Asad Umar, Former CEO Engro Corp; Dr Kamal Munir, Senor Lectutrer in Strategy, Judge Business School, University of Cambridge, Dr Syed M. Turab Hussain, Assistant Professor, School Humanities and Social Sciences, LUMS; and Dr. Ishrat Hussain, Dean and Director, Institute of Business Studies. Fatima Group of Companies team visited Lahore School of Economics for a recruitment drive on May 8, 2012. They were here in Campus to select students for their Management Trainee Program. The team included three alumni of the Lahore School, who had been working there since 2011, along with Sajid Ahmad, Recruitment and Selection Officer. Rida Ramzan, Management Trainee, Lahore School Alumnus Class of 2011, gave a video presentation about the company, which was followed by the recruitment test. 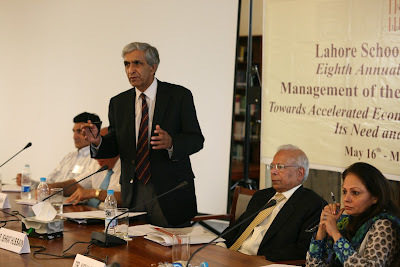 In the peak of the recruitment season, most of the reputed companies and organizations are coming to the Lahore School of Economics. 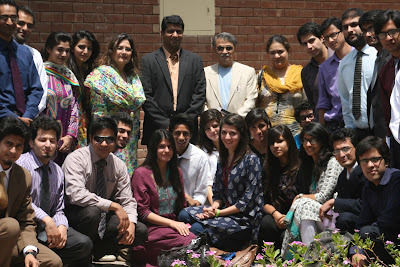 In the first week of the Summer Semester, UBL Recruitment Team was the second one to visit Lahore School on May 4, 2012. After a comprehensive presentation by Ms. Asma Ahmad, the Manager HR Products in the Mehmood Chaudhry Library, the students were interviewed in TRC III. 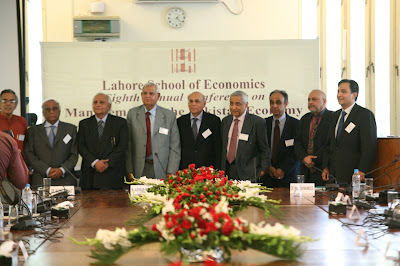 Lahore School of Economics alumni regularly visit back home. 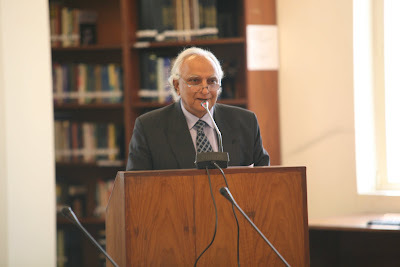 On May 3, 2012, a group of seven old students of the School visited and had lunch with Dr. Shahid Amjad Chaudry, the Rector and senior members of the faculty of Lahore School. On the occasion, Lahore School ambassadors discussed improvements that could be made and pointed out the improvements that they saw in the School, since the time they had left. They also discussed the situation of the industry that they were currently working in and also talked about career options and how to promote career opportunities to the current students [Vicky Zhuang Yi-Yin]. Dolls, Toys and More by S A J Shirazi was launched on April 28, 2012. 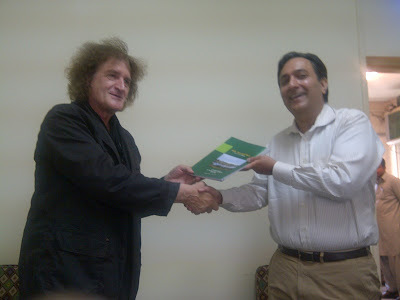 Prof. Dr. Norbert Pintsch, Senior Expert DGFK, Germany presented a copy of the book to Dr. Azam Chaudhry, the Dean, Lahore School of Economics. The book is a story of NGO working for poverty alleviation and preservation of cultural heritage in a village Thatta Ghulamka Dheroka in Punjab. 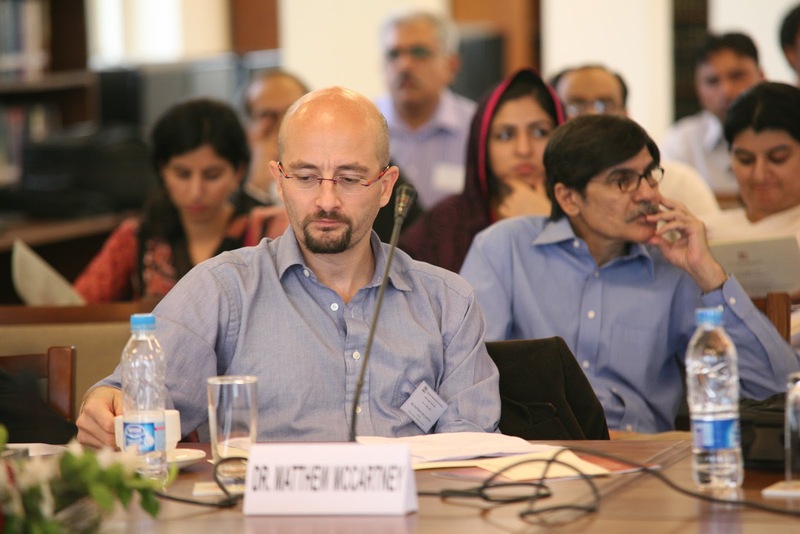 Dr. Norbert also apprised Dr. Azam Chaudhry of what has been happening in the village Thatta Ghulamka Dheroka – commonly called Dolls Village – over last two decades.